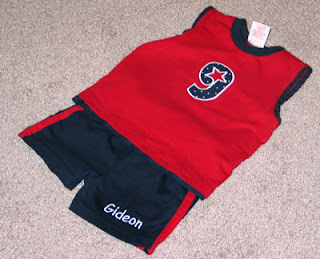 Thankfully I was able to find another little red/blue shirt to applique the "g" on for little Gideon. (I can no longer call him baby Gideon -- he turned one yesterday!) 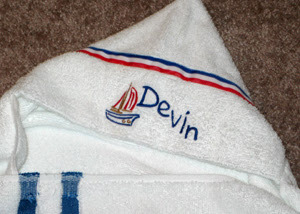 I also embroidered his name on a matching pair of shorts. Should make for a cute 4th of July outfit! It was delivered a day late due to my original disaster, but based on the adorable smile on his face, I don't think he minded a bit! UPDATE: This picture was taken on July 3 -- what a cutie! 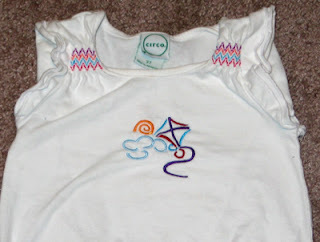 I was putting a cute little applique design on an 18 month shirt for a gift. It's a "g" shape, and then a name would stitch out over it. 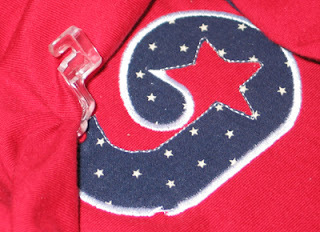 Since the machine was nearing the end of the satin stitch around the "g", I leaned down to get a small piece of water-soluble stabilizer to put in place before it started stitching the letters. When I sat back up, I discovered that part of the shirt had flopped onto the TOP of the embroidery foot and had been stitched THROUGH the foot ONTO the shirt. Absolutely no way to salvage this mess... I had to cut the shirt apart to retrieve my foot! Sigh... I spent a lot of time coming up with this design -- I hope I can buy another shirt just like this one! I made this tote today for my sister-in-law (her birthday is the 26th). 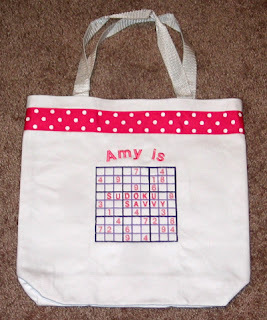 Amy is a Sudoku master, so when Embroidery Library created this design, Kathy got it with her in mind. 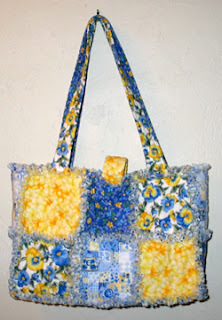 I took a premade tote bag, opened up the seam about 1/3 of the way to add the ribbon and facilitate hooping the bag. I stitched the design, sewed the bag back up and popped it in the mail! Hopefully it will arrive in time for her to open on Saturday! *if they turn out well, I've been successful in giving new life to something old! The first was this adorable little dress. I love the print at the bottom, but it had a tacky little bow stitched on under the neckline. So I took it off and added this redwork butterfly. I choose an orange thread to match the fabric ruffle at the bottom. 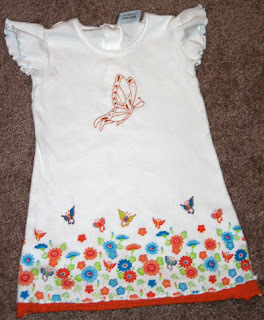 Unfortunately the dress is too small for Annaliese, so I plan to give it to Kenzie, who is a year younger. The second was this little striped shirt. I decided to try a fringed applique design on it. 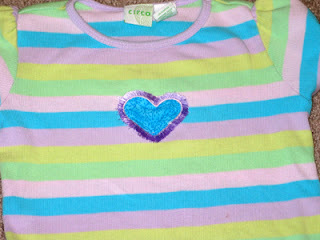 It turned out cute and really jazzed up a boring, slightly faded shirt! 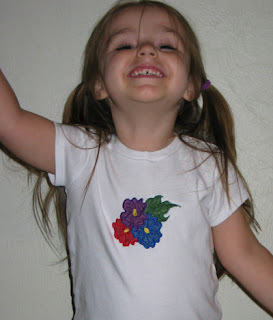 Today I spent Annaliese's nap time embroidering shirts! 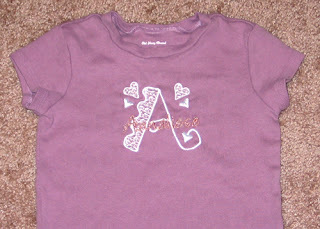 The first is a T-shirt for Annaliese. Earlier in the week we bought a cute white skirt, so I decided to use all white for this lacy monogram A. I used a metallic thread for her name. That was a booger to work with -- the thread broke at least 5 times! Maybe I need to change some settings...? Anyway, it washed well. 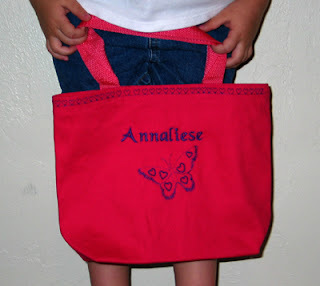 On Sunday I'll get a picture of Annaliese modeling it. 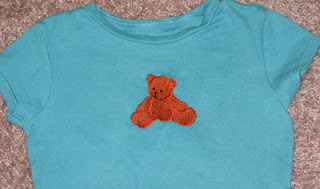 Next is a hand-me-down shirt that I decided to add an image to. Annaliese selected the kite design (of a couple options). I found threads that matched the stitching on the sleeves (as best possible with my small selection). It turned out cute and maybe now she'll be more excited about wearing it! 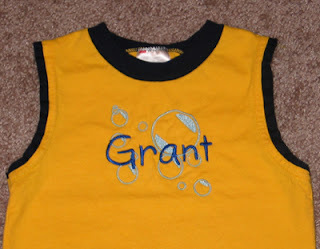 The final one is a gift for Grant's first birthday. I've had a hard time deciding what to put on his shirt, but today I found a free bubble design which is perfect because his nickname is Bubbles!! My only regret is that I picked a shirt with navy accents, not realizing I don't own any navy thread yet. :( But it's cute anyway. Hopefully he and his mommy Carla will like it! 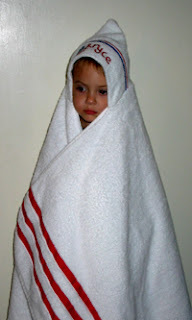 This towel wrap was inspired by a photo and directions I found on Sew Forum (http://www.sewforum.com/viewtopic.php?t=46219). 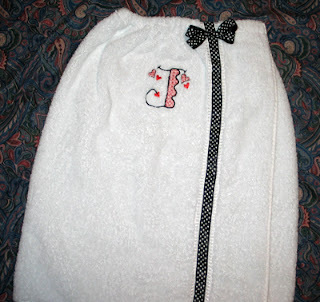 I took a bath towel, added ribbon and an embroidery design (Lacy Girl Monogram font by Anita, offered free on Sew Forum). The top is gathered with elastic and has a velcro closure. 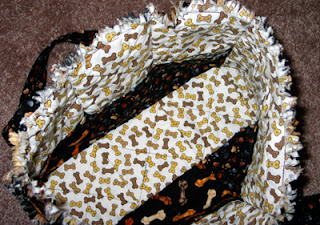 I was pleased with the results but had lots of altering to do since I wasn't using a pattern but sketching directions. The elastic still needs work, but in all, a reasonable project to duplicate! 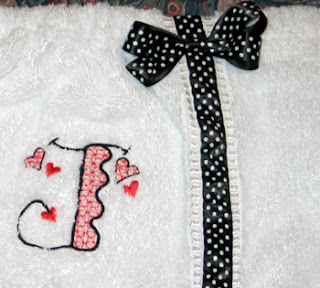 This was a quick project -- I found the picture late Tuesday evening, went shopping for ribbon and a towel Wednesday morning, stitched it all together and made alterations later in the day, and added the embroidery Thursday morning, all in time for a pool playdate at 10AM! 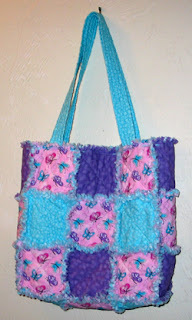 The following are pictures of the tote bags I made for my mother-in-law Kathy and Mom. 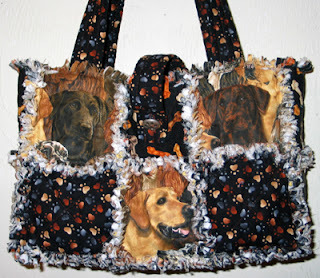 Kathy is the proud owner of labradors, so picking her fabrics was a breeze (especially since she provided them! 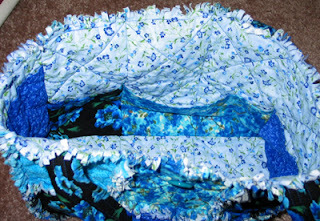 hee hee...) Mom loves blue, so once I found the floral print that seemed to be shouting out to me "this is the one" I was able to quickly select the rest of the fabrics. On these two bags, there are a total of 6 pockets. One of the side pockets is taller with extra rows of stitching to create slots for pens/pencils. The bags arrived in Illinois in time for them to open them together before Mother's Day. Both are very pleased with the results! This week I made two new tote bags that our moms will be receiving for Mother's Day. In anticipation of posting those pictures (once they have been unwrapped!) I decided to post pictures of my previous tote bags. 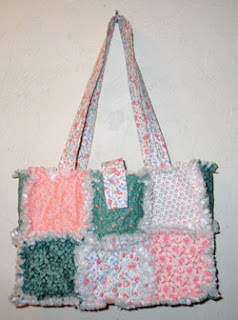 The peach & green was my first attempt at a rag-style bag, simply from looking at a picture. I was pleased with the results and have improved my design with each bag. The blue & yellow bag is what I currently carry as a purse. 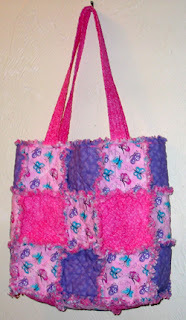 Next my friend Valerie asked me to make coordinating totes for her girls to use for church, so they are a bit taller to accomodate coloring books and the like. 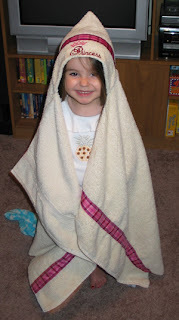 We had fun shopping for fabric together with our little girls! Another buddy of Annaliese's turned 3 today -- Alexa! 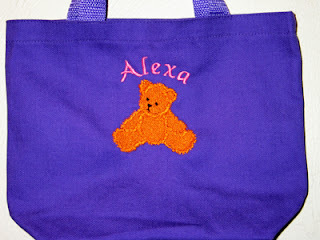 Annaliese helped me make her gift by picking out the purple tote bag and the colors of thread for her name and the bear. 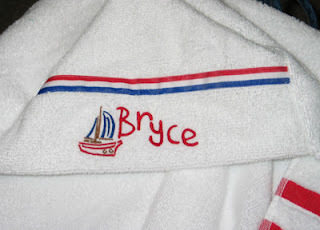 The first gift recipient of my embroidered projects was Bryce Kimber. 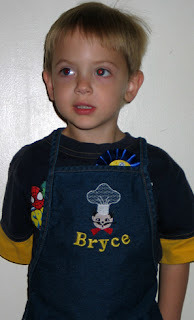 I personalized an apron for him to use when he helps Mommy in the kitchen (or while crafting). 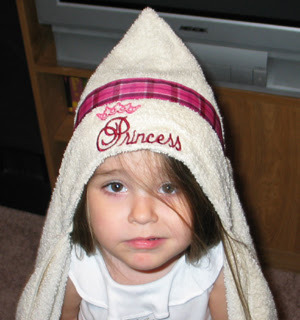 For this toddler towel I embroidered "Princess" on a washcloth, attached ribbon to the washcloth and towel, and then stitched them together (following a pattern Kathy had given me). What a face! She begrudgingly modeled it -- better pictures later! 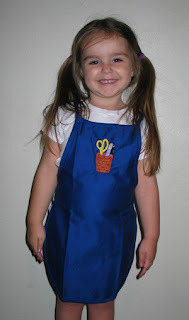 This was my first "filled" embroidery design, a cute cup with craft tools on a crafting apron. We've already used it to keep clothes safe while painting! 3. Trying one of the hundreds of decorative stitches my machine has. 4. Ripping a design out -- see, I had to hoop the bag upside down. I remembered to flip the name upside-down, but I forgot to flip the butterfly. Thankfully I noticed before I stitched too far. So I got my first experience of sitting down with a seam ripper and taking it out! Over the weekend, my mother-in-law Kathy delivered an embroidery machine to me, along with tons of supplies and knowledge that she so graciously shared with me! Forthcoming will be pictures of my first projects. 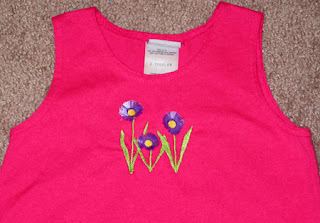 Here is the applique t-shirt I made for Annaliese! 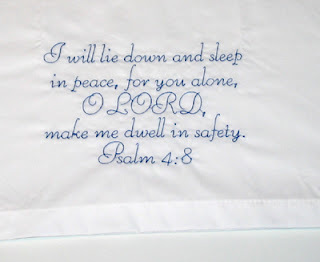 The design is a freebie from Sew Swell Designs. I've been quilting for about 5 years. My husband has done a fantastic job designing my website so I can share my past projects with the world: Janay's Quilts. As of late, I have started making projects solely for the purpose of selling them. In upcoming days, I hope to have a way to sell them via the internet. This weekend I received my Janome embroidery machine from my in-laws (THANK YOU, THANK YOU, THANK YOU!!!) 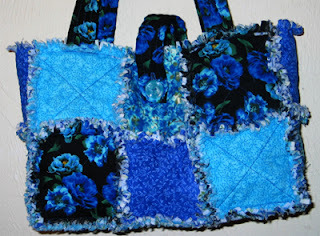 and anticipate doing lots of fantastic projects with it in addition to my quilting endevors. SOOOOOO... I decided it was time to create a blog. I hope to use this as a forum to share my hobby with you.